Being dry for a few weeks, I decided to do some long awaited maintenance on my “Spare Air,” which is the emergency three cubic feet of air that I carry with me on all my dives. My Spare Air was leaking to the point that it just couldn’t hold air for even one dive, hadn’t been given a visual inspection in the four years that I’ve had it and had mold and ocean slime encrusting the regulator. Facing dire poverty with furlough days at my real job and increasing beer prices, there was no way I could afford the $55 the manufacturer wanted for servicing, so I decided to do it myself. Note: Servicing and repairing your own equipment is frowned upon by a lot of divers, so I am not recommending that you should do what is described here. 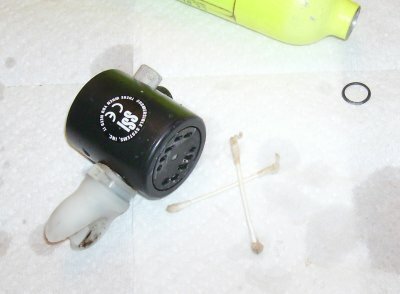 This article simply describes how I serviced my Spare Air and is not a Do-It-Yourself guide. I emptied all the air out of the cylinder, which was pretty much empty anyway. The air gauge is a little brass fitting that protrudes from the regulator’s side; using the gauge as leverage, the regulator came off fairly easily with a firm counter clockwise twist. 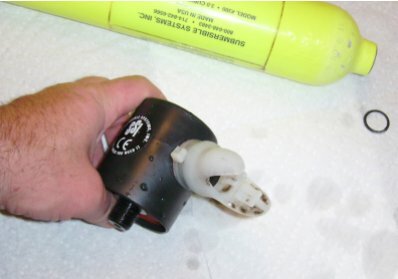 The “always on regulator” for the spare air is basically a sealed “black box” – no user serviceable parts; I had no idea how to take it apart and I was afraid that if I did, I wouldn’t be able to put it back together. However, I do know that it worked well, and I would have spent the $55 for professional servicing if there were problems. If I didn’t clean the mouthpiece, if I ever had to use it – assuming there was still air in it- I probably would have contracted some weird disease. Using alcohol and Q-tips, I cleaned underneath the rubber mesh that covered the purge button. To clean the petrified sea residue and mold off the regulator, I soaked it over night in a fairly strong solution of warm water and chlorine bleach. The next morning, most of the encrusted grit laid on the bottom of the bowl. 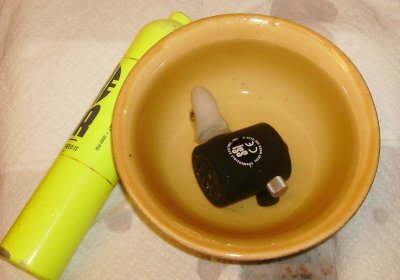 The mouthpiece did not need replacing and with a light scrubbing, the mold just wiped away. I soaked the regulator in warm water for another hour before laying it out to dry. 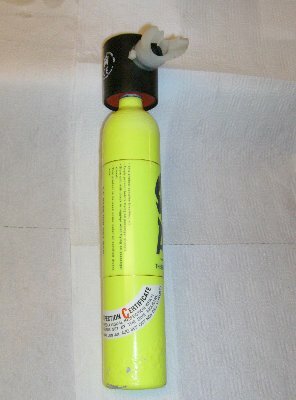 While getting my primary tanks filled at the local dive shop, I brought in the Spare Air cylinder and regulator. 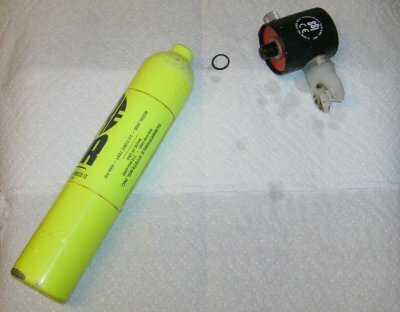 For $5, the manager gave the cylinder a visual inspection and replaced and lubricated the O-rings – there’s an O-ring between the regulator and cylinder and another one on the filling stem. Now, with a vis sticker, new O-rings and all the grime off, I once again have a reserve tank that holds air and is in perfect working order – while enjoying a $50 savings!